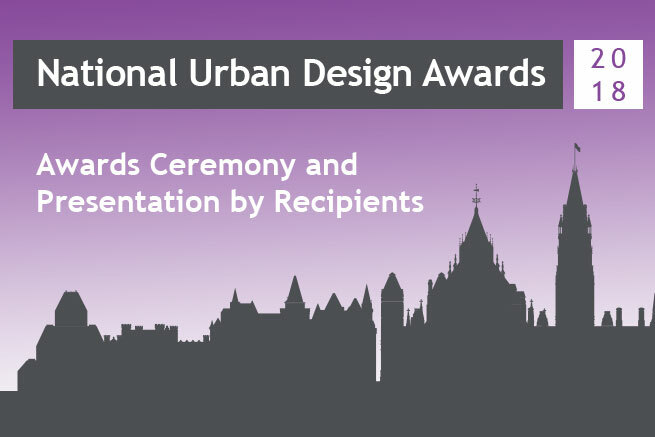 More than 200 people attended the National Urban Design Awards Ceremony and Presentations on January 7 at the Ottawa Art Gallery in Ottawa. The 12 recipients of the 2018 awards were on hand to discuss their winning projects and take questions from the audience. The event was streamed live on Facebook, where additional guests participated from across Canada. Other special guests in attendance included three mayors. Two of them were there to support winning projects in their communities: Tunu Napartuk, retired Mayor of Kuujjuaq in northern Québec, and Mayor Cathy Poirier of Percé, Québec. Ottawa Mayor Jim Watson welcomed everyone to the venue and congratulated the award winners. “A terrific evening at the Urban Design Awards to honour the creativity and dedication of architects, urban designers, landscape architects and planners,” Watson later tweeted. Thank you to the event sponsor, the Ontario Association of Landscape Architects, our media sponsor Global News, and our partners, the Canadian Institute of Planners and the Canadian Society of Landscape Architects.